Giada’s show can hit or miss with me, but the moment I saw her making these small chocolate meringue cupcakes I knew that my husband and I, and our entire lab group were going to profit from it in our early morning meeting. Line a 24-count mini-muffin pan with paper liners (1.25 inch diameter). Beat the egg yolks, vegetable oil, 1/3 cup of the sugar, cocoa powder, vanilla extract, cinnamon, and salt, at high speed until smooth, about 2 minutes. Mix in the melted chocolate chips and stir until smooth (mixture will be very thick). In a separate bowl, beat the egg whites at high speed until they hold soft peaks, about 3 minutes. With the machine running, gradually add the remaining 1/3 cup sugar and continue to beat until the mixture holds stiff peaks, about 2 minutes. Stir a small amount of the beaten egg whites into the chocolate, to lighten it up. .Using a spatula, fold the remaining egg white mixture. In batches, sift the flour over the batter and fold it in using a spatula. Fill each paper liner to the top with batter and bake for 12 minutes until puffed. Remove from the oven and let cool for 15 minutes. 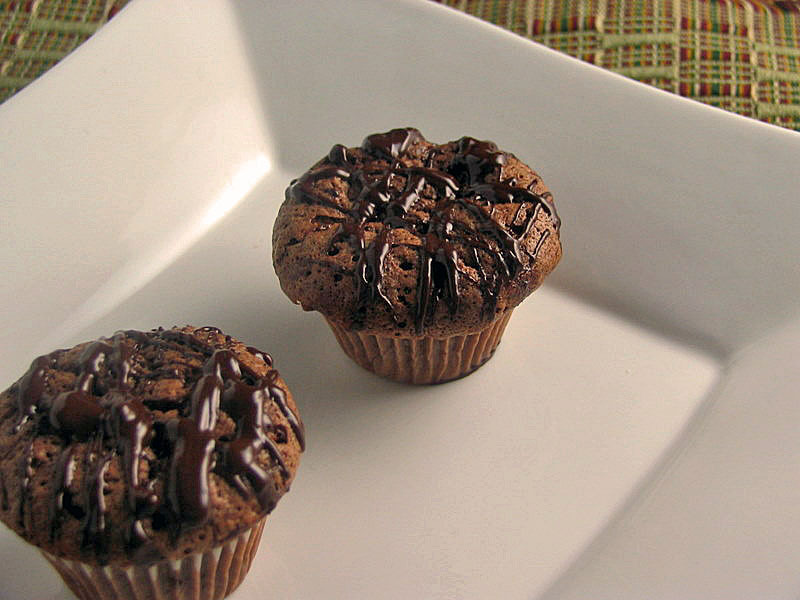 Using a fork, drizzle the chocolate mixture over the cupcakes. Allow the topping to harden for at least 1 1/2 hours at room temperature before serving. Comments: This recipe really was a “piece of cake” in two ways: it was simple, and it produced cupcakes that look dense, but were light and moist in your mouth. The chocolate drizzle, which according to Giada should harden in a couple of hours, refused to cooperate. Even the next morning it was still sticky to the touch, making the cupcakes quite messy to eat. A brief stay in the fridge (about 15 minutes or so) helped a little bit, and also made it easier to remove the paper. Aqueça o forno a 175 C.
Forre uma assadeira de 24 mini-muffins com forminhas de papel. Bata as gemas, o óleo, 1 / 3 de xícara de açúcar, chocolate em pó, baunilha, canela e sal, em alta velocidade até ficar cremoso, cerca de 2 minutos. Misture o chocolate derretido e mexa até ficar homogêneo (a mistura vai ser bem espessa). Em uma tigela, bata as claras em velocidade alta até que formem picos moles, cerca de 3 minutos. Com a máquina funcionando, gradualmente acrescente o açúcar restante (1 / 3 de xicara) e continue a bater até que a mistura forme picos duros, cerca de 2 minutos. Misture uma pequena quantidade de claras de ovos batidas no chocolate. Usando uma espátula, misture delicadamente as claras restantes. Aos poucos, peneire a farinha sobre a massa misturando levemente com uma espátula. Encha cada uma das forminhas com a massa e asse por 12 minutos. Retire do forno e deixe esfriar por 15 minutos. Para a cobertura: Em uma tigela pequena, misture o chocolate derretido e o óleo. Mexa até ficar homogêneo. Usando um garfo, regue a mistura de chocolate sobre os cupcakes. Deixe que a cobertura endureca por pelo menos 1 hora e meia a temperatura ambiente antes de servir. Sally, what an intriguing recipe! I’ve never seen anything quite like the process described. Thanks for sharing – they look delicious! Sally, it’s not unusual to add beaten eggwhites to a cake, but it is unusual to add eggwhites that have been effectively beaten into a meringue. Or at least in my limited experience! These look delicious. I often shy away from chocolate cupcakes, often because they are too dense. But, I love the idea of fluffy light ones! My husband will be soooo glad you posted this recipe. OMG! You’re baking cakes! Even little ones count you know. You go, girl! I agree with Jean. Cupcakes count as cakes. Jean is right. You are a full fledged baker now.